When a friend recently asked me for recommendations on a new serum, I quickly ran down in my mind the skincare brands I’ve tried, read about, and trust. Then I went to Sephora.com to refresh my mind about what all is out there. I found one name brand serum that seemed like it would work for my friend, and that I would personally try given the chance, but I also noticed its high price tag! The truth is that I love luxury brands and quality items, but I do not like to pay for them. I often buy sample sizes on ebay.com or I wait for awesome sales and gwps before buying brand names. And in the mean time, I look for “dupes” on Amazon.com. I swear that some of the “unbranded” (ok, yes, they technically do have brand names so I’m using my poetic license to refer to them as unbranded), work better than big, commercial, brand name products. While we’re at it, let me say something: yes, I am a shopping affiliate of Amazon, meaning that if you click a link from my post and buy an item, I can potentially earn a small % in commission. I am also an affiliate of individual brands, department stores, and shopping sites. This is pretty cool because, why not do it? It costs you, the reader, nothing and usually doesn’t compete with other promos. Also, it could someday maybe help me defray some of the costs of blogging (but that’s not your problem). Where am I going with this? I want to prove that I don’t have any extraordinary desire to promote Amazon over other shopping venues. The reason for this post is that the products I’m showing you really are that good, and I would (and do) recommend them to my own mother. 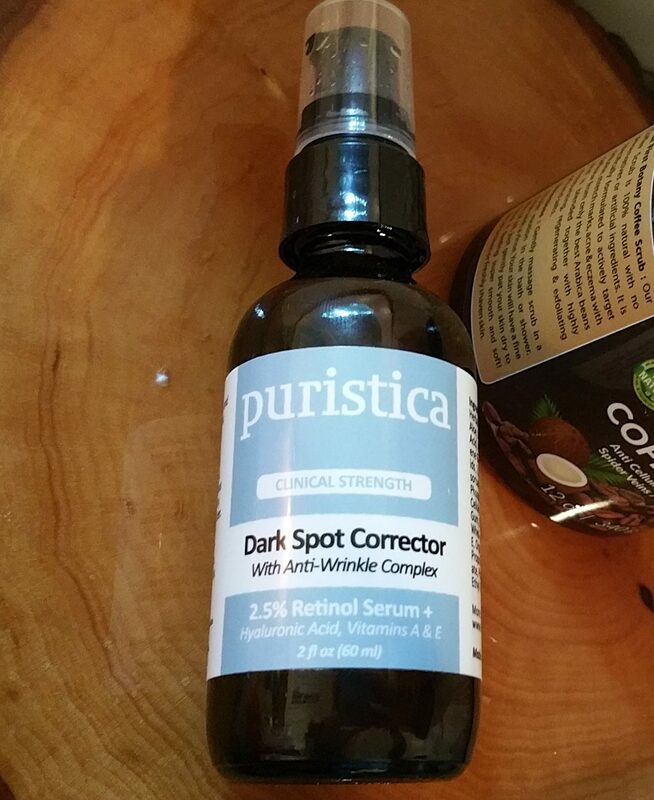 “Unbranded” Serum: Puristica Dark Spot Corrector with Anti-Wrinkle Complex – 2.5% Retinol Serum, Hyaluronic Acid, and Vitamins A & E: under $24 for 2 oz (or under $18 for 1 oz). I have a bottle of this on my bathroom counter top right now. I use it about every other day, both morning and night, alternating it with new things I’m testing out, and skipping the days when I apply self tanner (because retinol and self tanner kind of cancel each other out: the self tanner chemically reacts with the top layers of skin to produce pigment, and then the retinol comes in and tries to renew (read, shed) those same layers that you just tanned!) I initially chose this Puristica serum based on several factors: the consumer reviews were great; the ingredients were great; and it was cheap. It contains 2.5% retinol, which is a higher percentage than what is found in most brand name, and luxury, anti-aging serums. The fact that I saw results was the clincher, and now I’m on my second bottle (of the larger, 2 oz size). This serum works at least as well as my beloved, first ever retinol product, Philosophy “Help Me” treatment (1.05 oz for $49). Cream: Retinol Cream From Majestic Pure. This costs about $19 for .5 oz. It’s not as cheap as the Puristica serum, but compared to big brand names it’s a bargain. It also contains 2.5% retinol, which is higher concentration than most creams out there. It can be combined with the serum: just be careful if you have dry or sensitive skin, because that’s a double whammy of retinol. First Botany Cosmeceuticals Arabica Coffee Scrub: 12 oz for about $14. I discovered this on “Prime Day,” when it was reduced for a lightening deal. Here’s the key to using this scrub: mix it with some body wash/shower gel before you use it. It is extremely concentrated, and works better when you use it with a handful of shower gel because it’s easier to spread and really apply to your skin. I cannot comment on the claims that this scrub helps cellulite, stretch marks, spider veins, and wrinkles. However, it has the potential to reduce swelling if the coffee beans used in it have usable caffeine (caffeine being one of those magic ingredients that really help under eye puffing and temporarily tightening facial skin). I have personally used all the items in this post, with this one being the sole exception: First Botany Cosmeceuticals 100% Natural Anti Fungal Tea Tree Oil Body & Foot Scrub 12 oz. with Dead Sea Salt. I wish I had gotten it on Prime Day as well. However, it wasn’t until I had a personal problem that I realized how helpful this would be: the problem was a cut on my heel that didn’t want to stop hurting or heal. (If this is too much information for you, I’m sorry.) But I think the majority of women from time to exfoliate or buff their feet. Anyway, I needed to continue exfoliating my foot even with that cut, to help prevent more areas from cracking. It was then that I regretted not buying the Tea Tree Oil Scrub, because tea tree is somewhat of a power house ingredient, helping prevent nasty fungus and possibly infections. Of course, I would be cautious with the scrub on a crack until I determined that none of the scrub’s ingredients were aggravating it. So that scrub will be my next cosmetic purchase from Amazon.com. In sum, the two retinol products and the two scrubs are great deals. They just happen to make it into my list today, but there are others out there that I will talk about some day. Meanwhile, go have a look and tell me if you find any awesome unbranded cosmetics!